San Francisco (Obama.net)- President Barack Obama has done many things in his life. He has been a Senator, lawyer, and law school teacher. But Barack Obama has also been a published author. Obama has already written two books in his young life, “Dreams From My Father,” and “The Audacity of Hope.” Now, President Obama is reaching out to the youth of the United States via a new children’s book. 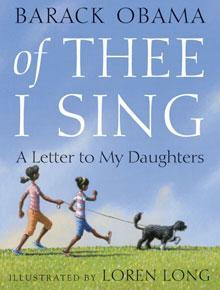 Obama’s new work, titled “Of Thee I Sing: A Letter to My Daughters,” has already soared to the top 25 in sales for both Barnes & Noble and Amazon as of Wednesday. The book, which was announced on Wednesday, will be published by Alfred A. Knopf Books of Random House Children’s Books. The first edition is set to have half of a million copies released in two months on November 16th. The book is Obama’s way of honoring thirteen great American heroes and introducing them to the children of America. Those praised in the book include former Major League Baseball legend Jackie Robinson, the first President of the United States George Washington, and Georgia O’Keeffe, the artist. The book, which President Barack Obama wrote prior to becoming President, is expected to be a best seller. Robert Gibbs, the Press Secretary for the White House, announced that none of the Obama’s would be directly involved in the promotions for the new book. The cover of the book will feature President Obama’s two daughters, Malia and Sasha. “Of Thee I Sing” is to be an illustrated book. The books illustrations were provided by Loren Long. The book, which will sell for $17.99, will have all of its profits go to pay for scholarships for the children of troops who were either killed or disabled. “Of Thee I Sing” is the first part of a three-book deal Obama signed shortly after being victorious in the Illinois Senate race in 2004.